I remember the first evening we had our Eglu... as the sun went down, I dutifully lured the chooks inside and closed the door so they'd be safe and sound until the morning. Bright and early the next day, I went out to the backyard and opened the door again and our chooks came tumbling out and into the run anxious to get access again to their feed and water. I repeated this for the next couple overnights (lure them in, close the door... open the door, chooks scramble out) until we went out of town for the weekend. Instead of enlisting a chicken-sitter, I simply loaded up the food and water bowls and left the girls to their own devices. Necessarily, this meant the door stayed open morning, noon, and night. Nothing untoward happened, and I actually liked the freedom to sleep in a bit in the morning and not worry my thirsty chickens were desperately clawing to break out of their coop to get much needed water out in the run. So, since that first week, I haven't closed the door again. In fact, it's been three months since I closed the girls in the coop at night. Given the way the folks at Omlet designed the Eglu, I haven't felt the need to put the girls away, especially given how temperate the climate is here in the Bay Area. If the design of the run is such that it's difficult (dare I say impossible?) 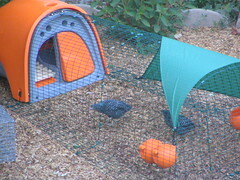 for a predator to dig under the wire to get at the birds, why close the door between the run and the coop? Yes, I've seen the neighborhood cat pacing around the backyard trying to figure out how to get in, but that's been during the day when they girls wouldn't be locked in the coop anyway. No raccoons near here that I know of, but would they even be able to get in? And since Sophia seems capable of laying eggs in the nesting box without the privacy of a closed door, that reason for closing them up seems to be moot. Now, it's gotten me to wonder, why even bother to close the door of the Eglu until things get cold this winter and the girls need the warmth of the close confines? I know others, who have housing arrangements that do not include an Eglu have to worry about battening down the hatches at night, but why should I shut them in? Would love to hear others' thoughts on the matter, especially those with Eglus like me. Thomas, I don't have an Eglu but I also don't close the girls in at night. I used to, but now not only is the hen door open, but the whole front of the roost box has been open 24x7 most of the summer. I think as long as you're not worried about predators it's fine to leave it open. Once the cold weather gets here we'll start closing the girls in again. And when we get frost/snow I usually turn on a heat lamp because the couple of banties I have can't take the cold as well as the bigger girls. There's no right way to keep hens - only the way the works for you and your girls. Thanks for the reminder about "the right way," Laura, and glad to hear others out there keep the door open all the time, too. We live low in San Mateo, near downtown and I know we have raccoons in the neighborhood: we have seen them. I don't know if they can get in our backyard, but I assume they can. The cats that wander in over the fence don't bother me, because they don't burrow. Dogs don't climb fences and I don't think they are small enough to get under the gates. If you don't have predators up there on the hill, then leave the pop door open. Maybe I'm just paranoid, but I do close up the Eglu door at night. I also remove the food container and lock it up in the same secure bin where I store their bag of feed, which is inside the garage. My reasons for doing all of this are many. * I know we DO have raccoons in the area and have heard about how clever and vicious they can be towards chickens. A guy about 6 blocks away from me has (had?) chickens and raccoons were a major problem for him. The day I stopped to talk with him about his chickens he pointed out that he had just lost his best hen the night before to a raccoon. She was not secured inside the coop that night due to his oversight, and so he was awoken at about 3 AM by the hen's screams as the raccoon killed her. All that was left were a few feathers. * I've heard on poultry message boards that raccoons have reached in through poultry netting to grab at chickens, then pulled off various body parts of the poor thing. The Eglu run wire is spaced far enough apart that a raccoon could do the same to any of my girls. I've even thought about securing hardware cloth to the run panels to provide extra protection. * Food is removed because I don't want any predator or pest animal (e.g. rats, mice, etc.) to follow their nose to the run and either make a habit of raiding the poultry feed (thereby leaving less for my chickens) or to realizing there is a much a tastier option than just some dried grains sitting right there for the taking. Yes, the girls do tumble out each AM eager to get at the food (not so much the water), but they aren't going to be irreperably harmed by waiting an hour or even 2 after sunrise to eat. I'd rather deal with a hungry bird than a dead one. But, as Laura says you know your chickens and you know your neighborhood, so do what seems best for you. I just wanted to offer up an amendment to my comment above (because I didn't mention it). Part of why I'm comfortable leaving everything open is because I'm pretty confident nothing can get through the chicken wire into the run, so by defaut no predators can get into our roost box. If you're not sure about the same, then I would close the door. If you are pretty confident that they're safe from predators and it's reasonably warm at night, I don't see any reason that you "have" to close it up. I am thinking of getting an eglu and a couple of chickens for our home in San Mateo. How does one obtain a license for this? Hi Lisa, I'm not sure if the same rules apply in San Mateo as they do here in Redwood City, but I didn't need to get any permit to get our chickens, I just had to conform to the code (no more than four hens, no roosters). Of course, your mileage may vary. Best to check with the city offices to make sure you're in line (if you choose to stay legal).